QUEBEC – Osisko Mining of Toronto continues to drill its Windfall Lake gold project 100 km east of Lebel-sur-Quevillon in Urban Township. 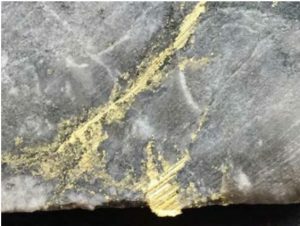 Most recently, core from the Lynx deposit assayed a whopping 131 g/t gold over 2 metres. Even when the assay is cut, the result is 100 g/t gold. Nor was that the only bonanza drilled. Another hole tested 113 g/t gold uncut over 2.0 metres (75.1 g/t cut). A second hole returned 73.5 g/t gold uncut over 2.2 metres (29.1 g/t cut). Two additional holes assayed 30.0 g/t gold over 2.9 metres and 5.32 g/t gold over 15.7 metres. The Windfall Lake property is unveiling its potential as Osisko keeps the drills turning. The resource currently stands at 2.76 million tonnes grading 8.42 g/t gold in the indicated category and 3.51 million tonnes grading 7.62 g/t in the inferred category. Most of the mineralization occurs in the Main zone that trends southwest-northeast for at least 1,400 metres and is about 600 metres wide. Mineralization has been discovered only 30 metres under the surface and as deep as 870 metres.